Cyclocephala immaculata, (also known as the “annual” white grub) and May or June beetles, Phyllophaga spp. Over 90% of the damage is caused by the annual grub. Japanese beetle larvae may also be lawn grubs. The adult beetles of the annual white grub do not feed on foliage. Adult May and June beetles feed primarily on tree leaves, but the damage is insignificant. White grubs are a favorite food of moles, shrews, chipmunks, skunks, raccoons, and birds, which may tear up the lawn in search of the grubs. Since the grubs live and eat underground, they are frequently not noticed. The first indication of damage is generally a gradual thinning and weakening of the lawn followed by small patches of dead or wilting grass even in the presence of adequate soil moisture. Fescue grass is especially susceptible. Damage is often most evident in the middle of August through September. Animals digging up the lawn for the grubs or large numbers of adult beetles being attracted to lights at night may also signal a problem. Diagnosis requires peeling back areas of lawn with a sharp shovel and looking for the grubs. If fewer than ten grubs are present per square foot, it is unlikely that control is required as the amount of damage caused is minimal. Some grubs can be found in the healthiest of lawns. As the name implies, the annual grub goes from egg to adult in one year. May or June beetles take two or three years to complete a generation. 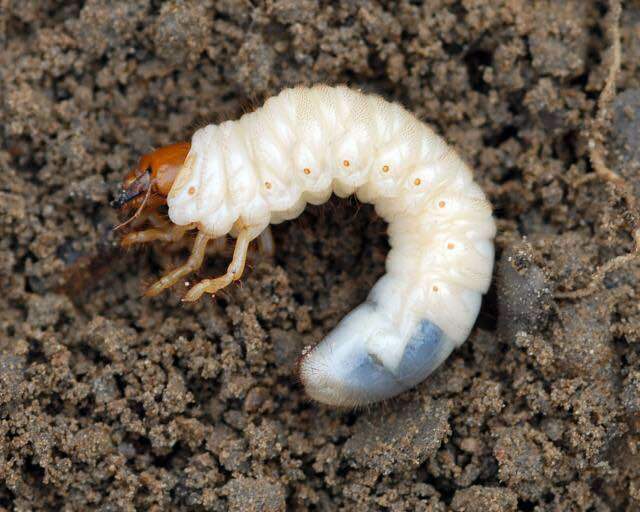 The grubs feed for two or three years in the ground before emerging as an adult beetle. Both emerge as adults in May through early August. They mate and lay eggs in the top two inches of moist, warm soil in lawn areas. In about two weeks, the larvae hatch and the grubs begin feeding on organic matter, including grass roots, until September or October when lower soil temperatures force the grubs deeper in the soil where they hibernate. The following spring, the annual grub moves to the top of the soil where it feeds until May and then pupates and emerges as an adult in June through early August. May or June beetle grubs continue feeding for one or two more years before pupation in July. They emerge as adults the following spring. Every year some adults of the May or June beetles emerge since not all of the grubs are at the same stage of development. One preventive grub control application in the early spring can provide season long control of grubs. Contact us today to schedule your grub control application.